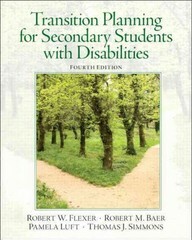 Transition Planning for Secondary Students with Disabilities 4 Edition Transition Planning for Secondary Students with Disabilities, 4/e is a comprehensive and practical resource for anyone involved in dealing with and meeting the transition needs of students with disabilities. The authors describe the varied transition needs readers are likely to encounter in their work and provide a succinct look at the options and career paths potentially available. They cover implementing transition systems, creating a transition perspective of education, and promoting movement to postschool environments.